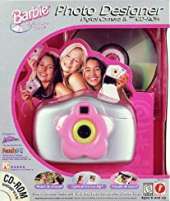 Use your Barbie Photo Designer Digital Camera to snap pictures just about anywhere. The Barbie Digital Camera stores 6 photos in its flash memory or an unlimited number when connected to your PC. Snap pictures indoors or outdoors - the camera doesn't need a flash. Uploading pictures to your computer lets you see them instantly. Using the Barbie Photo Designer software, you can create personalized photo projects easily and quickly. You can also print your creations on paper, cards, or stickers to share with family and friends.